When first-generation college student Montana York was shopping for schools, the opportunities available at NC State’s College of Agriculture and Life Sciences caught her eye. Then she was named a Thomas Jefferson Scholar, a highly competitive dual-degree partnership between CALS and the College of Humanities and Social Sciences. She started packing her bags. Now Montana is a CALS Ambassador double-majoring in agricultural science and political science, a rising sophomore with a growing number of industry connections and a spring break spent studying abroad in the United Kingdom. She is the Garnett Whitehurst Scholar, supported through a Farm-to-Philanthropy endowment created by CALS alumnus Dr. Garnett Whitehurst of New Bern, North Carolina. Montana recently spoke at an AgCarolina Farm Credit Board meeting about her experiences with ASPIRE, CALS’ program to bridge deficits in rural high school students’ performance on the ACT college entrance exam. Her dream? To use her policy and ag expertise gained at CALS to influence the global conversation about agriculture. 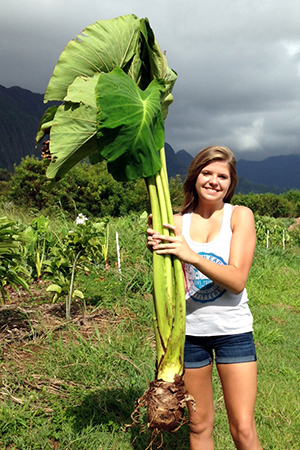 Sophomore political science and agricultural science major Montana York harvesting a taro plant in Hawaii. It was an honor to be accepted to NC State, but I also considered both Clemson and Mississippi State because they have strong agricultural programs as well. There were two things that brought me to Raleigh: The first was the agricultural science major. What makes it unique is the ability to concentrate on two areas of study. For me, that’s agribusiness and animal science. Becoming a Thomas Jefferson Scholar was a big factor in my decision. It was more than just the opportunity to also earn a degree in political science, which is an area I’m interested in. As a first generation college student, it was important to know I’d have peers and professors who would have my back and guide me along the way. I can’t imagine being anywhere else. What have you learned at CALS that you will take with you when you graduate? There are a lot of opportunities out there, but they don’t always just land at your feet. There was a gentleman with the North Carolina Department of Agriculture and Consumer Services who spoke to one of my classes last semester, and I reached out to him about potential internships at the NCDA. There’s one in his department that would give me a ton of experience, but it’s for seniors only. He asked me to reach back out to him in a few years and I definitely will. If I hadn’t asked, I wouldn’t have known about it. What is your career goal? Why did you choose it? I’m still trying to figure that out! I spent two weeks in Hawaii a few years ago studying agriculture through a program sponsored by the USDA, and it opened my eyes to the role government agencies play in our industry. I have an interest in public policy and agricultural law. Right now, my plan is to attend law school after I graduate. I’d love to have a role in helping shape public opinion of the agricultural industry. This summer, I am taking four online classes through NC State as well as interning at a mortgage company in Charlotte. I’m loving it and learning so much. This fall I will be a CALS Ambassador and I look forward to sharing my experiences with future students and hopefully I can sway them to join the Pack. Tell me about a transformative experience you had outside the classroom. I spent my spring break this year traveling through the United Kingdom studying global food systems and sustainable agriculture through NC State Study Abroad. It was my first time out of the country and the perfect introduction to studying overseas.